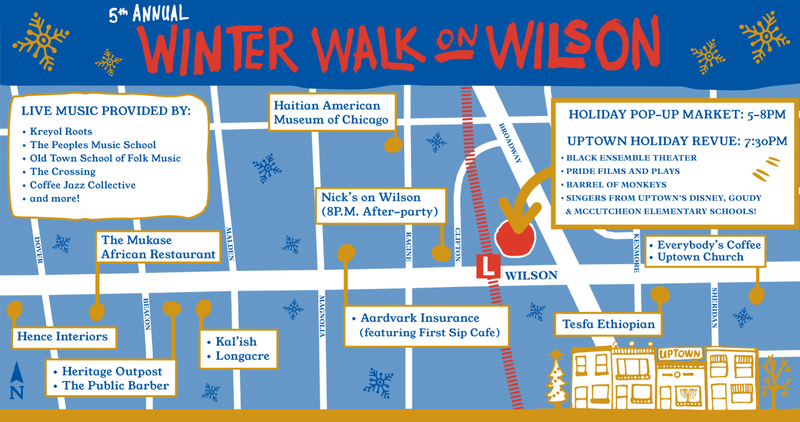 Are you ready for the fifth annual Winter Walk on Wilson? Enjoy music, treats, and pop-up shops as you meet friends and neighbors. 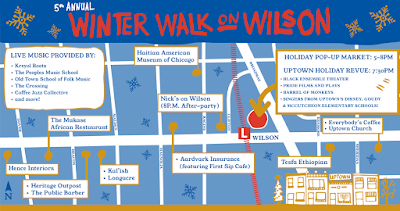 "Business Partners - The Chamber for Uptown is hosting our 5th Annual WINTER WALK ON WILSON on Friday, November 30 from 5-8PM. This FREE event features sweet treats, warm drinks, and menu samples offered by local Uptown businesses as well as live holiday music along the Wilson commercial corridor from Clark to Sheridan. We’re pleased to announce this year’s event will also feature a variety of vendors at the Chicago Market's Holiday Pop-Up Market at their new home inside the historic Gerber Building. Bring the kids and take a selfie with Santa! FREE with RSVP! LIVE MUSIC provided by Kreyol Roots, The Peoples Music School, Old Town School of Folk Music, Coffee Jazz Collective, Side by Side, and more! 7:30 PM. 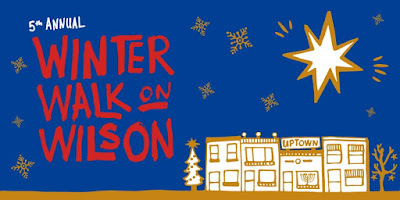 Join us inside the Chicago Market (corner of Wilson & Broadway) for the UPTOWN HOLIDAY REVUE featuring performances and holiday show previews by local arts organizations including Black Ensemble Theater, Pride Films and Plays, Barrel of Monkeys, and Inspired Youth Singers (students from Uptown’s own Goudy, McCutcheon, and Disney elementary schools)! 8:00 PM. AFTER-PARTY at Nick's On Wilson (1140 W. Wilson) with holiday drink specials!" More information is here. And RSVP, too!